The Analytics Edge Core Add-in is designed to make it easier and a lot faster to create, edit, and refresh a custom Excel report. It is a bit different from other tools, so it is worth taking a minute to see how it works. Like Excel, it can be easy to start but quickly become overwhelming — if you want help building your analysis, contact support@analyticsedge.com. This website also contains examples of reports you can make as well as helpful articles explaining analysis techniques you can use. The Analytics Edge ribbon bar is the command center for the Core Add-in. From here you can refresh your report, manage Quick Queries, select functions to add to a Macro, and manage the optional Connectors. You can also check or update your licenses, and schedule workbook refreshes. The Core add-in supports the same Quick Queries as the Standard and Basic Add-ins — simply select a worksheet cell and start a Quick Query [close the Task Pane to work on Quick Queries]. The results will be placed into the worksheet at the cell you selected. Quick Queries can be edited by selecting the cell and clicking the Edit Query button. For more complex analysis, like combining queries or performing calculations, you can create Macros of queries and functions. Macros are managed on the Task Pane. When you click Refresh All, the add-in will run all the Quick Queries and then all the Macros. Note that Analytics Edge macros are not the same as Excel macros; there is no programming involved. Every step is created and edited with a Function wizard. 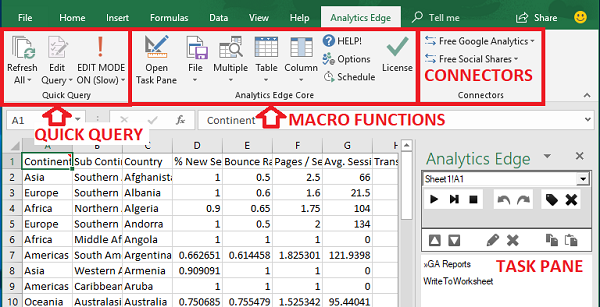 There is no need to use a macro-enabled workbook; Analytics Edge uses standard Excel (XLSX) files. The Analytics Edge Core Add-in works like a macro recorder, with every Function or Connector operation recorded automatically in the Task Pane. As you execute queries and functions, they are added to the list in the Task Pane. You can step through the macro, edit individual functions, and even insert or reorder functions as desired. The Task Pane makes it quick and easy. To get all of your data into a worksheet, you can add a File > Write To Worksheet function to your macro. As a quick shortcut, you can select a worksheet cell and click File > Write To Current Cell. Note that you can also Append to Worksheet to build on previous results. To run a macro, you can click on the Run icon in the Task Pane. To run all Quick Queries and all Macros, click the Refresh All button on the ribbon.